Spouse(s)Linda Coleman John Stewart Coleman (October 15, 1934 – January 20, 2018)dit. Yes According to Professor Lockwood! He believes that we are already beginning to see a change in our climate - witness the colder winters and poor summers of recent years - and that over the next few decades there could be a slide to a new Maunder minimum. It’s worth stressing that not every winter would be severe; nor would every summer be poor. But harsh winters and unsettled summers would become more frequent. Professor Lockwood doesn’t hold back in his description of the potential impacts such a scenario would have in the UK. He says such a change to our climate could have profound implications for energy policy and our transport infrastructure. Although the biggest impact of such solar driven change would be regional, like here in the UK and across Europe, there would be global implications too. the Maunder minimum of the 1600s was estimated to have shaved 0.3C to 0.4C from global temperatures. Cooling is a natural phenomenon that would last for 60-70 years. But should North Western Europe be heading for a new "little ice age", there could also be far reaching political and agricultural implications. 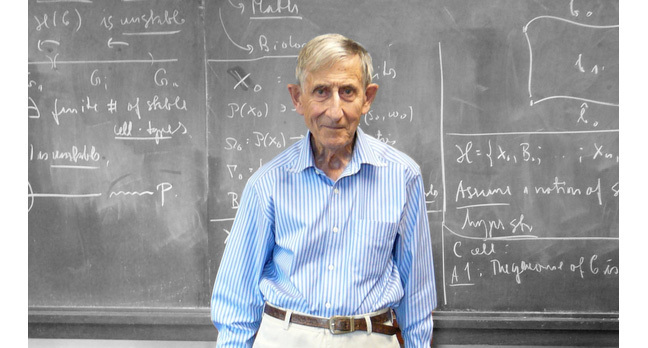 11 Oct 2015 at 23:00, Andrew OrlowskiInterview The life of physicist Freeman Dyson spans advising bomber command in World War II, working at Princeton University in the States as a contemporary of Einstein, and providing advice to the US government on a wide range of scientific and technical issues. He is a rare public intellectual who writes prolifically for a wide audience. He has also campaigned against nuclear weapons proliferation. At America's Oak Ridge National Laboratory, Dyson was looking at the climate system before it became a hot political issue, over 25 years ago. He provides a robust foreword to a report written by Intergovernmental Panel on Climate Change cofounder Indur Goklany on CO2 – a report published [PDF] today by the Global Warming Policy Foundation (GWPF). An Obama supporter who describes himself as "100 per cent Democrat," Dyson says he is disappointed that the President "chose the wrong side." Increasing CO2 in the atmosphere does more good than harm, he argues, but it is not an insurmountable crisis. Climate change, he tells us, "is not a scientific mystery but a human mystery. How does it happen that a whole generation of scientific experts is blind to obvious facts?" We invited Dyson to talk about climate change and other matters, including a question from your correspondent's kids – how will we do interstellar travel? [Laughs] Yes. I don't know why, it's a mood of the times. I don't understand that better than anyone else. It is true that there's a large community of people who make their money by scaring the public, so money is certainly involved to some extent, but I don't think that's the full explanation. If you could give your own scientific recommendations for carbon dioxide policy at COP21 in Paris, what would they be? Certainly land management would be one. Particularly building up topsoil, which you can do in lots of ways. Not just growing trees, there are many things you can do which are just as good. Inducing snowfall is something you can do which hasn't been discussed very much, to keep the oceans from rising. The rise of the oceans is a real problem and while they're not rising as fast as people say, they're still rising. That could be stopped if you could arrange that it snows a bit more in Antarctica. That's something that could be quite feasible, but it's not been looked at very much. Are climate models getting better? You wrote how they have the most awful fudges, and they only really impress people who don't know about them. I would say the opposite. What has happened in the past 10 years is that the discrepancies between what's observed and what's predicted have become much stronger. It's clear now the models are wrong, but it wasn't so clear 10 years ago. I can't say if they'll always be wrong, but the observations are improving and so the models are becoming more verifiable. It's now difficult for scientists to have frank and honest input into public debates. Prof Brian Cox, who is the public face of physics in the UK thanks to the BBC, has said he has no obligation to listen to "deniers," or to any other views other than the orthodoxy. That's a problem, but still I find that I have things to say and people do listen to me, and people have no particular complaints. It's very sad that in this country, political opinion parted [people's views on climate change]. I'm 100 per cent Democrat myself, and I like Obama. But he took the wrong side on this issue, and the Republicans took the right side. Because the big growing countries need fossil fuels, the political goal of mitigation, by reducing or redirecting industrial activity and consumer behaviour, now seems quite futile in the West. China and India rely on coal to keep growing, so they'll clearly be burning coal in huge amounts. They need that to get rich. Whatever the rest of the world agrees to, China and India will continue to burn coal, so the discussion is quite pointless. At the same time, coal is very unpleasant stuff, and there are problems with coal quite apart from climate. I remember in England when we burned coal, everything was filthy. It was really bad, and that's the way it is now in China, but you can clean that up as we did in England. It takes a certain amount of political willpower, and that takes time. Pollution is quite separate to the climate problem: one can be solved, and the other cannot, and the public doesn't understand that. No [laughs]. Well, India and China aren't buying that. When you go beyond 50 years, everything will change. As far as the next 50 years are concerned, there are two main forces of energy, which are coal and shale gas. Emissions have been going down in the US while they've going up in Europe, and that's because of shale gas. It's only half the carbon dioxide emissions of coal. China may in fact be able to develop shale gas on a big scale and that means they burn a lot less coal.